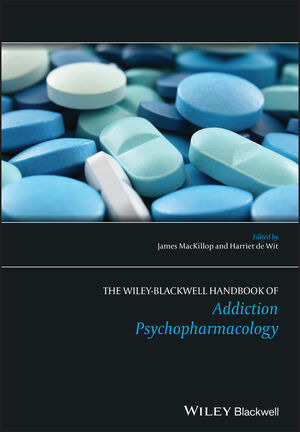 The Wiley-Blackwell Handbook of Addiction Psychopharmacology presents a comprehensive guide to contemporary research approaches to the study of drug addiction in adults. With a focus on empirically relevant research methods and nuanced methodologies, it provides practical tools to enable strong psychopharmacological practices. Contributions from experts in diverse domains offer reviews of the most current experimental methodologies, make recommendations for ‘best-practices', and identify future directions for the field. Topics covered include core methods for assessing drug effects, distal and proximal determinants of drug use, and insights from cognitive neuroscience. James MacKillop is Associate Professor, Department of Psychology, University of Georgia; and Adjunct Associate Professor, Department of Behavioral and Social Sciences, Brown University. Dr. MacKillop's research has been supported by the National Institutes of Health, the Robert Wood Johnson Foundation, and the Alcoholic Medical Research Foundation, among other granting agencies, and he has published over 70 peer-reviewed articles and book chapters in this area. Harriet de Wit is Professor, Department of Psychiatry and Behavioral Neuroscience, University of Chicago. Dr. de Wit has published over 200 empirical papers and is an editor of the journals Psychopharmacology and Alcoholism: Clinical and Experimental Research.